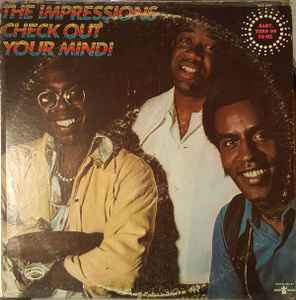 The Impressions ‎– Check Out Your Mind! Published By – Curtom Publishing Co. Check Out Your Mind was twelfth studio and last Impressions’ album on which Curtis Mayfield would be singing as a member of the Chicago based blues and rhythm group, where the title track opened the adventure with a blistering bit of psychedelic soul, filled material that epitomized the essences of being black in the 1960’s all before Mayfield set out on his own and created his sensational Super Fly album. The Impressions were incredibly popular during those years with songs of love, loss and social commentary, all filled with dynamic rhythms, splendid horn arrangements and infectious beats based around the heritage of urban soul, regarded as being one of singular influences for Bob Marley & The Wailers. The Impressions fused their music with lush smooth harmonies, though by this time, Curtis Mayfield was injecting more material containing social consciousness and the power of being black. As with many groups, especially those who relied on using material often penned for them by others, the remaining members were feeling unsure about taking this step with Mayfield, leaving Curtis to to venture down that avenue alone. Whether this was or wasn’t a good choice is debatable, as the Super Fly album may just have been a bit more luscious with some or all of his old bandmates … though had Curtis not left the group, they no doubt would have become Curtis Mayfield & The Impressions very quickly. The album is seriously funky, laced with undeniable grooves that reach out to tickle your toes into dancing along. The record is rhythmically diverse, with ballads often filtered with Latin influences, as opposed to the funkier Motown stompers of the time. Oddly enough Mayfield’s vocals (with the Impressions) had a childlike quality to them, one of purity and wonder, and if stood up against his solo material, the change was nothing short of astounding. Each of the Impressions’ albums offered up something different, embracing something different as influences changed and shifted. Check Out Your Mind is an insanely good album, and being re-released on Rhino from source material, there’s no excuse for anyone not to own this gem … so sit back, slide into its grooves and allow your mind to be blown.